Aerodactyl in game: 5,125 Who? Important notice! Pokemon Aerodactyl is a fictional character of humans. Aerodactyl is a reptilian, bipedal Pokémon with large, membranous wings. It has sharply pointed ears and a fierce expression with intense eyes. Its snout is ridged, with a gaping mouth and strong lower jaw full of serrated fangs. Its body is covered in light violet-gray skin with violet wings. 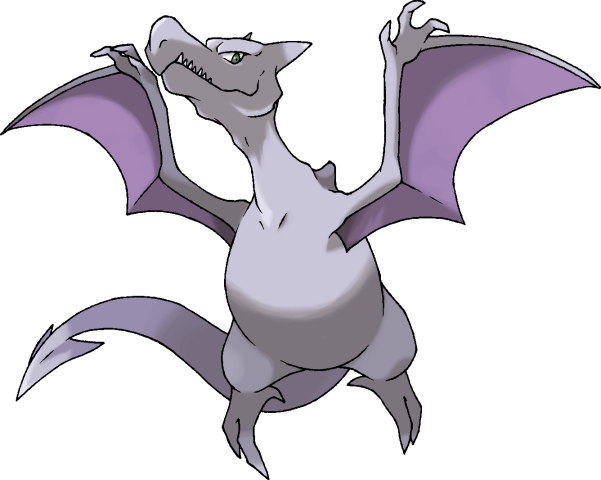 Aerodactyl's wings consist of a membrane running from the side of the body to the tip of an elongated finger. The clawed hands at the bend of each wing allow it to grasp objects. A hump-like ridge grows from its back and it has a strong, arrow-tipped tail. Its talon-like feet are capable of scooping up and tightly clutching its prey in flight. When Aerodactyl Mega Evolves, its body begins to turn to stone, which some researchers claim is its original appearance before fossilization. It grows larger in size and sprouts jagged black spikes all over its body. There are five spikes at the wrist joint of each wing, replacing its hands. Three small spikes grow along the tail, and the spine on its back has become large and stony. The rear talons of the feet have also turned black. Its chin and ears are each decorated with a large spike, with rocky plates marking its eyebrows and the corners of its jaw. Similar stone ornaments are present on its chest on its torso: two small marks flanking a longer mark. Its eyes have changed to a dark green color. When it Mega Evolves, Mega Aerodactyl becomes even more vicious than it was before. The reason for that supposedly is because of the excess of this Pokémon's power is causing it pain. 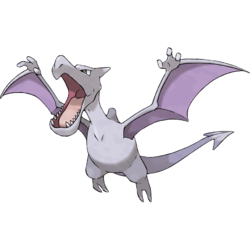 Due to the sharp appearance of Aerodactyl's fangs, it was originally thought to be exclusively a carnivore. However, the anime shows it joyfully consuming fruit. Its serrated fangs and ferocious attitude are nevertheless very imposing, and it is said to be capable of effortlessly ripping out enemies' throats. 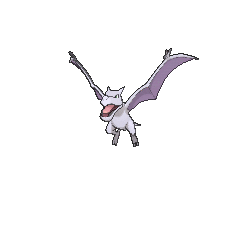 With its impressive wings, Aerodactyl fearlessly soars high in the skies, freely letting out its high-pitched cries. When at rest it enjoys the safety and seclusion of the mountains where it likes to nest. 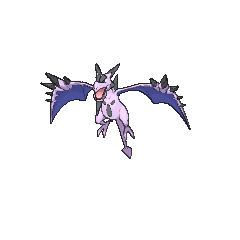 Aerodactyl is extant using Fossil revitalization, but is considered extinct in the wild. 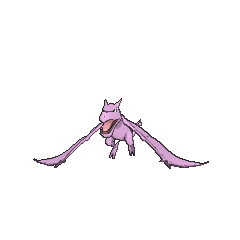 Aerodactyl first appeared in Attack of the Prehistoric Pokémon. It scared off the other Generation I Fossil Pokémon that were chasing Ash and Team Rocket. It then kidnapped the young Trainer, who was rescued by Jigglypuff's song. Todd took a photo of this Aerodactyl, which was seen in Pokémon Paparazzi. The same Aerodactyl appeared in a flashback in Who Gets To Keep Togepi? and The Fires of a Red-Hot Reunion!. Fossils of Kabutops and Aerodactyl were resurrected by Annie and Oakley in Pokémon Heroes: Latios & Latias; in the English dub, they were once used by an evil Pokémon Trainer to torment the civilians of Alto Mare, but were drowned when a Latios brought water to the city. They were sent to chase after Ash and Latias. They have blank, yellow-tinted eyes with no pupils and are lined with a thick black outline. Putting the Air Back in Aerodactyl! featured an Aerodactyl that was revived by Gary Oak. The Aerodactyl seemed to enjoy eating a pear-like fruit that grew in the forests of an island. 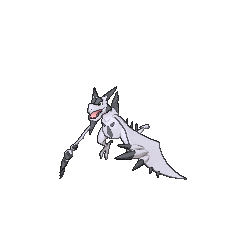 Team Rocket agents Butch and Cassidy wanted to steal this Aerodactyl in order to present it to Dr. Namba, but were stopped by Gary's Umbreon and Dodrio, and the Aerodactyl itself, who sent the two Rockets flying with a Hyper Beam. 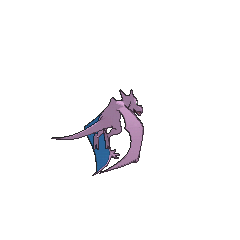 Another Aerodactyl appeared in Wild in the Streets, where it terrorized Oreburgh City after being revived from its Fossil state, until it was caught by Dr. Kenzo. 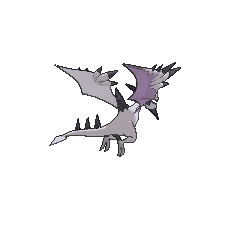 An Aerodactyl appeared in A League of His Own!, under the ownership of Trevor, where it was used in his battle against Alain in the Lumiose Conference. Two Aerodactyl can be seen flying within the Tree of Beginning in Lucario and the Mystery of Mew. Also, one appeared in the opening of the movie. 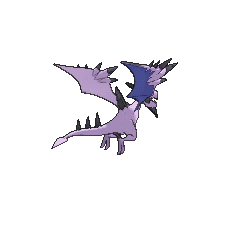 A Mirage Aerodactyl appeared in The Mastermind of Mirage Pokémon to kidnap Professor Oak and Dr. Yung. An Aerodactyl made a brief cameo in Pokémon Mystery Dungeon: Explorers of Sky - Beyond Time & Darkness and one appeared in the opening scenes of Zoroark: Master of Illusions. An Aerodactyl that can Mega Evolve into Mega Aerodactyl appeared in Mega Evolution Special I. An Aerodactyl appeared as a skeleton in an exhibit in the Ambrette Town laboratory in Coming Back Into The Cold!. Two Aerodactyl appeared in The Tiny Caretaker!. 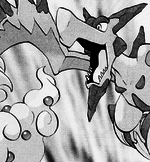 Red obtains an Aerodactyl from a resurrected piece of Old Amber which he revives in Holy Moltres and names it Aero. He has since then used it extensively for aerial transportation and combat. Another appeared as a silhouette in the Holy Moltres in Blaine's fantasy of what the Old Amber would turn into when it was revived. It is also the only Fossil Pokémon that can be obtained in any way other than breeding, reviving its Fossil or from the Dream World: it is available through an in-game trade in Pokémon Gold, Silver, and Crystal and is one of Hayley's trades. 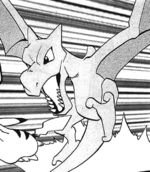 During its first appearance in Attack of the Prehistoric Pokémon, it was implied that Aerodactyl was carnivorous, based on its teeth (and the reactions of the other Fossil Pokémon when it arrived). 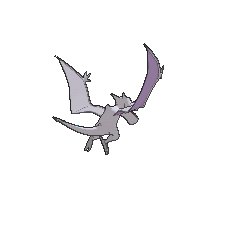 However, in Putting the Air Back in Aerodactyl!, it is shown and proven to be at least omnivorous, based on its joyful consumption of fruit.